How Drayton McLane built a Texas empire that touches the world. Minute Maid Park in Houston, home of the Astros. Texas has produced more than its share of business success stories, but it's safe to say that few can top that of self-made billionaire Drayton McLane of Temple, Texas. A Texas native, he turned his family's grocery distribution business, McLane Co., into a global force and sold it to Walmart. As president and CEO of the company, he led it to annual sales growth of 30 percent or more in each of the 32 years that he was at the helm. About 27 years ago, he founded McLane Company, a holding company with a wide array of investments, including a majority ownership stake in the Houston Astros. So, who better to talk about Texas as a prime location for business than Drayton McLane, one of the lead investors in the Texas Economic Development Corp.? You have built a number of successful business ventures in Texas. What is it about this state that enables you to build companies and teams that thrive? Drayton McLane: The number one thing is the attitude of leadership in Texas — from business and government. We have no state income tax. That has been a great advantage. It is just a good environment. We have a big state. There are a lot of areas where people can locate. Houston has the Port of Houston — the second largest in the U.S. Dallas is a very good financial services and corporate headquarters market. And the energy business is huge here and it touches the whole world. What did you learn from owning and running the Houston Astros? McLane: We tried to recruit young, great athletes from all over the world. As players got into the Houston Astros system, they liked it. Free agents liked the personal income tax situation in Texas. It was always a great recruiting tool. They loved the weather and the environment. And Minute Maid Park in Houston is one of the best ballparks in the country. When the Astros won a World Championship in 2017, what did that mean to you personally and to the people of Houston? McLane: It meant a great deal. We had owned the franchise for 19 years. We went to the World Series in 2005 and played the Chicago White Sox, but we did not win it. The franchise had existed since 1963. We were the Colt 45s for several years before changing our name to the Astros. Then we built the Eighth Wonder of the World — the Houston Astrodome. There has always been great confidence in Houston. And then we landed the stars who would guide the ball club to the world championship: Jose Altuve, George Springer and Dallas Keuchel. We recruited them in the minor league system. They came up through the Astros system. Finally, we showed great resilience following Hurricane Harvey last year. It rained over 51 inches in a few days. The city of Houston has recovered so remarkably from Hurricane Harvey. I don't know of any businesses that left the area. They all came back. When the Astros won the World Series, it showed the whole world what Houston and its people were made of. Outside of building the Astros into a championship contender, what are some other accomplishments that give you great pride? McLane: McLane started as a small business in 1959. We went from $2.5 million in 1960 to over $40 billion today in the grocery logistics business. And it all started in Temple, Texas, in the middle of the state. Technology played a big role in how we built the company. Austin today is the center of technology in the Southwest. Recruiting and developing executives was key. Our headquarters has always been in Temple and has 12,000 employees and does over $40 billion in business each year. It helps that the big cities in Houston and Dallas have great airports. Austin has developed and has some international flights too. Air travel is a real asset in Texas. What is Houston's best-kept secret? McLane: The resilience of Houston. They focus on the oil business, but the largest business in Houston is health care. MD Anderson is the world-renowned center for cancer treatment. There are nine hospitals and three medical schools at the Texas Medical Center. Many flights going to the Middle East and Europe originate out of Houston due to the oil business. Houston is an entrepreneurial city. People will encourage you here. The banking system here is critical. And with the Port of Houston, goods are coming from China and the super container ships come here. Houston has everything a business needs and wants to thrive. You were CEO of your family's company for over 30 years and led it to average a yearly sales growth of 30 percent or more during that period. What was your secret to success? McLane: For 32 years, we grew 30 percent or more every year. We are good business leaders. We build big distribution centers. We built over 30 of them all over the U.S. Our headquarters is in Texas. Texas Commerce was the biggest bank at the time that we were getting going. Their leadership provided financing. Airports were key too. There is just a great environment in Texas. That success has carried over to our current project — building a high-speed rail line from Houston to Dallas. We are working on that right now with JR Railroads in Japan. They have the most efficient high-speed rail. They have never had an accident in all the years they have operated a high-speed train in Japan. We will build one from the heart of Houston to downtown Dallas. It will take 70 minutes to travel from one city to the other and go over 200 miles per hour, and will be the first ever in the U.S. I chair the board of this project, and we are trying to build this with all private money. That in itself reflects the can-do attitude of Texas. Was selling the McLane Co. to your friend Sam Walton in 1991 for $50 million and 10.4 million shares of Walmart the best business deal you ever made? McLane: It was one of the better ones. Sam Walton approached me, and they were a great customer. They wanted to build a new store of 200,000 square feet and have a supermarket in it. He said they needed someone to provide the food logistics. I became Vice Chair of Walmart, and McLane became a subsidiary of Walmart. What is the one thing you wish the rest of America understood about Texas? McLane: That there are great people who live in Texas, and they want to make Texas and the U.S. better. We are ready to provide bold leadership. South by Southwest, for example, is a bold concept. Technology is developing here. Texas has great values and bold ideas in business. Just as Toyota came here to put its headquarters in North Dallas, others will come here and be welcome here too. I like big ideas. 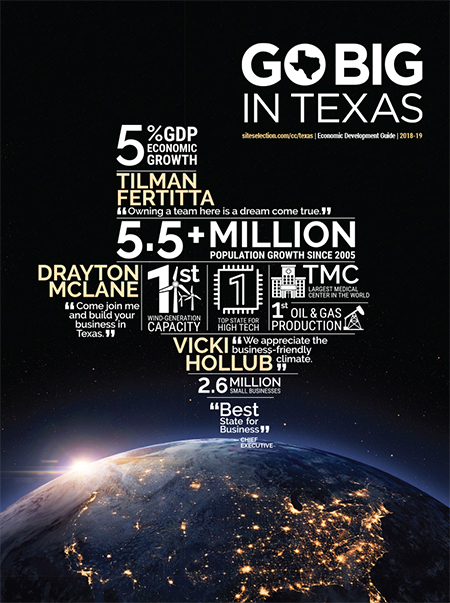 If you like big ideas too, come join me and build your business in Texas.